Celebrate the service of a friend or family member with Army Flag Frames from Flags Connections. These beautiful cases are perfect for the Army. If you want to preserve the memory and bravery of those who serve so proudly, Flags Connections can help. Dedicated to preventing the brave heroes from forever being forgotten, order an elegant Army Flag Frame from Flags Connections. Each case is constructed of richly colored mahogany hardwood that will look beautiful with any décor. The hardwood frame is inserted with thick glass, not acrylic and will not scratch. Each display case can hold a flag up to 5’ x 9.6’. 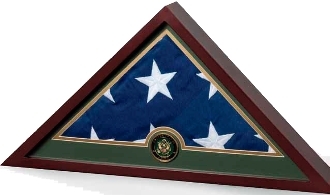 The outside dimension of the Army Flag Frame is 26” x 13” x 3.5” and is embellished with a die-cast, gold plated United States Armed Forces medallion that is centered on a bevel-cut double mat. Choose from an Army, Air Force, marine Corps, Navy Coast Guard, or a United States flag medallion. The back is easy to open, is lined with felt, and features a scratch resistant bottom. 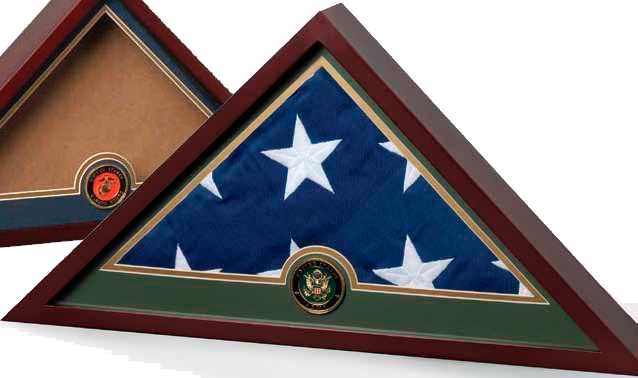 Proudly made in the U.S.A. the Army mahogany colored hardwood frame is available with or without a 5’ x 9.6’ Interment flag that is identical to the flags that are manufactured for the Veterans Administration. The Army Flag Frame can be proudly displayed in your home or office and comes complete with mountable hardware. Flags Connections is proud to sell the high quality Army Flag Frame handcrafted from the best solid hardwood. You might find a cheaper, poor quality Army Flag Frame, but you will not find a Army Flag Frame that is made like this. Flags Connections is the only place on the internet that sells the highest quality Army Flag Frames in the world, and best of all the Army Flag Frame is proudly made in the U.S.A.
Flags Connections offers the fastest shipping available, with orders typically shipped on the same business day that the order is placed. The convenient online ordering is fast, safe and secure. Flag Connections also honors Army accounts for easy payments. If you want to honor and cherish the achievements of your loved ones, call or click today. If you have questions, just contact a friendly excellent customer service representative from Flags Connections. There is no better way to show a loved one who is or has served in the armed forces how much you care than with a Army Flag Frame. Constructed of rich mahogany colored hardwood and inserted with thick glass each display case holds up to a 5’ x 9.6’ cotton flag. A die-cast, gold plated United States Armed Forces medallion is centered on a bevel-cut double-mat. Easy open back panel and felt lined, scratch resistant bottom. Available with or with out a 5’ x 9.6’ embroidered cotton Interment flag which is identical to those we manufacture for the Veterans Administration. Orders for the Army flag display case are usually shipped out within one business day to places within the USA and Canada.